Netflix is certainly Google when it comes to movies and TV shows. Gone are those days when we used stand in long queues to buy tickets for movie shows. Now we prefer to stay home instead, relax on our big couch, watch movies on Netflix and chill all day long. And why not! Netflix has a huge collection of movies and shows of any genre we want from action, romance to thriller. So why go theater and waste extra bucks? While watching movies or shows in foreign language, subtitles prove out be one big time savior. They remove the language barrier and allow us to focus on the movie plot. Netflix has some pretty decent subtitles, but sometimes they get lost in the background and it become quite difficult to read them. 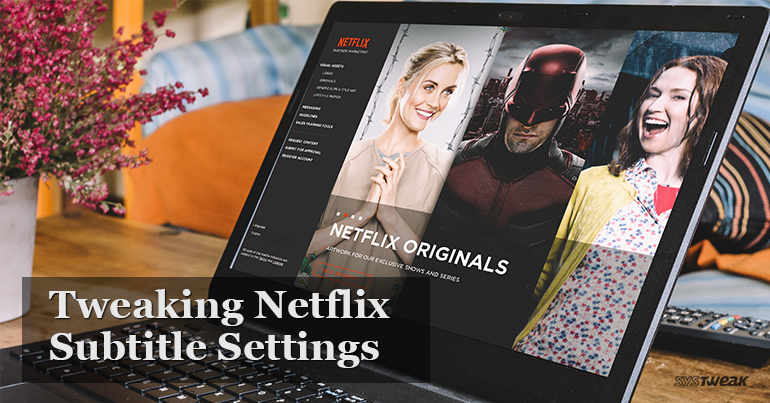 Fortunately, Netflix offers us an option to customize and edit the subtitles just how we like it from their color, font, background and more. Launch Netflix on your browser and tap on your profile icon from the top right corner. 2. A drop down menu will appear, select “Account”. 3. Now head on to “My Profile” section and tap on “Subtitle appearance”. 4. Here Netflix will offer you a bunch of fun options to pick. Let’s discuss each one of them in detail. Font: Netflix allows you to pick from 7 different beautiful fonts from comic sans, cursive style and more. Just next to this option you’ll also find a color picker, which allows you to set your font from 8 pre-selected font colors. Apart from this, you can also manage the transparency levels of the font to be displayed. Text Size: If you have reading disabilities then this option can prove out to be quite useful. You can easily customize the font size and pick from small, medium or large text. By default the font size of subtitles on Netflix is set as medium. Shadow: Here you can add a few special effects like a drop shadow, a text outline etc. Right next to the Shadow dropdown you’ll find a color picker which can be used to set the shadow color for your selected font. Background: This adds a solid background behind your font to enhance the visibility. You can also select the transparency level and set it as per your preference. Window: This works same as the above option, the only difference you’ll find is with text spacing and padding. You can pick the window color from 8 pre-selected colors or even leave it transparent if you want. 5. Once you’re done tap on SAVE button to save the settings. So folks, here was a quick guide on tweaking the subtitle settings on Netflix. Play around and tweak some of the settings and set the subtitle font to suit your visibility and taste!